Carved stone High Crosses are scattered throughout the Irish landscape. The oldest High Cross in Ireland is at the ancient church at Clonmacnois in County Offaly. 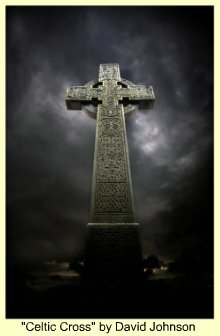 Celtic crosses are the definitive emblems of the unique evolution of the faith of the Irish people. They symbolize the revolutionary union of Druid and Christian beliefs that makes the Irish people so unique. Whether depicted vertically or diagonally, the cross has long been a sacred symbol, even before the dawn of Christianity. It represented the four directions of the winds - North, South, East, West. It also stood for the four seasons, and the energy of the male life force. Some people believe the cross signifies four roads that are created by the omphalos, which is the sacred point at which Heaven and Earth are interconnected. According to The Celtic Art Source Book, by Courtney Davis, crosses have been found in Europe that date as far back as 10,000 BC. For example, there are crosses carved into tiny pebbles inside a cave in the French Pyrenees. The people who made these carvings probably believed the crosses would carry the spirits of the dead peacefully into the Otherworld. Christians believe the cross symbolizes Christ's rule over all things...length, height, breadth, and depth. But it did not actually become a symbol of Christianity at all until around the 4th century. When Christian monks began carrying out their mission in Ireland, crosses were frequently carved out of stone. The crosses were intricately embellished with knotwork and artistic depictions of the Gospels. Sometimes these crosses were called "Scripture Crosses". The ring at the center is what makes Irish Celtic crosses unique. In the ancient pagan Celtic world, the circle/wheel represented many sacred things...the life cycle, the cycles of the seasons, the Sun, wholeness, and the energy of the female life force. Others say the cross represents the Cosmic Order of all things. The Celts also believed that the center of the wheel was where the Heavens and the Earth met, a place where the soul could reach ultimate enlightenment. The cross within the ring has been regarded as a sacred symbol of the Sun since pre-Christian times. The circle and the cross are both universal symbols in cultures all over the world. The Celtic Druids worshipped both the sun and the moon. The circle is often used to represent the moon, and the cross often represents the sun. The circle signifies infinity...with no beginning and no end. While the cross extends in four directions and has a distinctive center point. For Irish Catholics, the symbolism of the cross design was a little different than their pagan counterparts of ages past. The Circle in the center represented eternity and the infinite nature of God's Love. 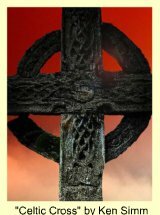 Even the earliest Christian Celtic crosses were designed with the more ancient, symmetrical representation. The Book of Kells, which was compiled by Irish-Catholic monks features the older, symmetrical Celtic crosses. But Christian Celtic crosses as we know them today place the ring much higher, where the head of Christ was on the Cross. Perhaps this is why so many believe the ring represents a halo. 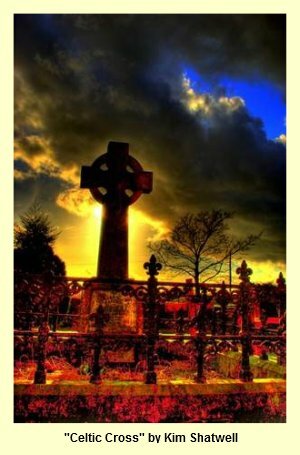 In many ways, Irish Crosses represent the way Christian missionaries, led by Saint Patrick, united ancient pagan symbols and beliefs with the new Christian worldview. Their non-violent conversion of the pagans was revolutionary and unprecedented in Christianity's early years. Rather than an oppressive conversion from pagan ways to Christianity, Saint Patrick and his missionaries had the wisdom to explain Christian concepts using symbols the pagan Druids already held sacred. One example of how St. Patrick used sacred pagan symbols to explain the concepts of Christianity is represented in the shamrock legend. 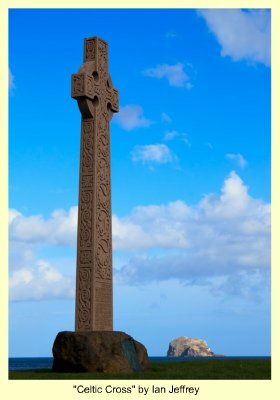 But the most widely honored spiritual symbol that signifies both the Celtic pride of the Irish people as well as their devotion to Christianity is the Celtic Cross. The eternal connection of all things in the Heavens and the Earth.